Our new HME RAT engine has arrived but is not yet in service. All members are going through driver training and pump training. The unit should be in service by Sunday. Greater Eaglebrick FD has annexed State Park VFD, which covers the unincorporated portions of Eaglebrick State Park. GEFD will be servicing this area beginning 7/1/15. GEFD is in the process of purchasing a 2014 HME Rapid Attack Truck to serve as the engine out of that station. In addition, GEFD will be retaining a Ford C tanker previously owned by State Park VFD and a 2011 Ford/Unruh brush truck that is currently serving from station 2. Station 4 has been closed and it's apparatus have been split between stations 1 and 3 in order to increase staffing and resources available in our busier areas. We will continue to cover the village of Little Brick Creek but the responding units will now becoming from station 3. This will not cause a significant change in response time and will actually allow for more personnel to be available for responses throughout all four communities. Chief William Black has announced his retirement as full-time Chief of GEFD. He will stay on as a part-time Assistant Chief. Former Brickfield Chief Jonathan Ness has been sworn in as the new full-time Chief of Greater Eaglebrick Fire District. GEFD has placed an order with Braun Ambulances of Van Wert, Ohio for a 2015 Dodge Ram/Braun Liberty ambulance. 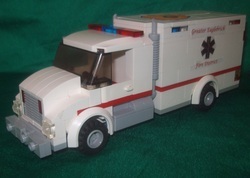 Once in service, the ambulance will serve from station 3. To the right is a digital rendering of what the new rig will look like. Greater Eaglebrick FD has signed a contract to begin coverage of the village of Little Brick Creek and purchase some of its former department's apparatus. The new station will be Greater Eaglebrick FD Station 4. Pictures will be available under the Stations tab shortly. GEFD's Station 3 is now operational again after being temporarily shut down after the former Engine 3 was destroyed by an electrical fire. A replacement pumper (details on the station 3 page) was placed in service this morning. GEFD has re-designed their ambulance graphics with the purchase of a 2011 Freightliner/Horton unit. Since 2009, GEFD ambulances have been white with a thin lime green stripe and a thick lime green stripe. 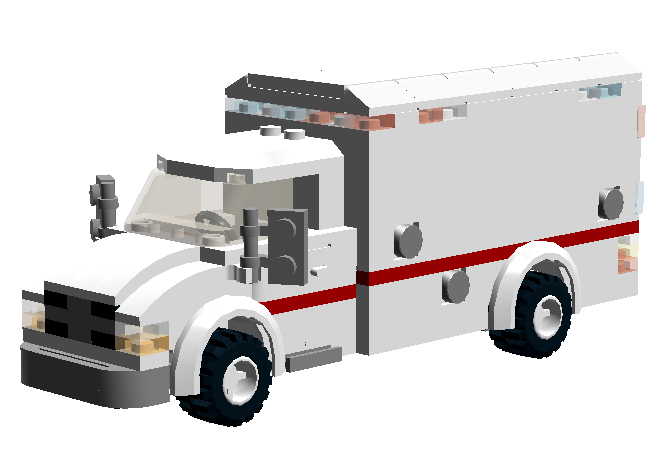 The new graphics feature a thin red stripe, black, silver and red star of life, and the GEFD patch on the vehicle roof. 1221 has already undergone re-striping and is back in service. GEFD's new ambulance has arrived and will be placed in service tomorrow. It will be replacing Medic 1212 and will run out of station 1. Details on the Station 1 page. Brickland Heights has opted out of their contract with GEFD, effective immediately. Brickland Heights Fire Department has resumed operations after internal affairs struggles. The city of Brickwell has just merged with GEFD, effective 10-23-13. GEFD will now be operating out of three stations, one in Brickway Manor (Headquarters), one in Blackbrick Township (Station 3) and one in Brickwell (Station 2). Station 3 will operate as a two man station and stations 1 and 2 will have either three or four on duty depending on the day. Apparatus re-assignments will follow. GEFD's second apparatus from a two piece order from Pierce have arrived. The 2 rigs were bought at a discount with a grant. The rigs are in service as Engine 1215 and Quint 1219. GEFD is going through some structural changes as well as apparatus changes. After a natural disaster destroyed the entire Brickville Fire/Rescue fleet, GEFD has agreed to cover parts of Brickville stations 1 & 5's districts until replacements have been secured. The adjacent structure fires on Deer Park Road have been ruled as arson. Allegedly, there are many hunters in the area. With the construction of a new subdivision in that area, the hunters would lose a prime deer hunting location. The police department, in joint with the fire investigator, are following a few leads. GEFD is proud to announce that William Black has been sworn in as our new Chief. He spent 30 years working for Battlebrick Heights Fire/Rescue. He was then hired as Chief of Brickland Heights Fire department, where he served for 3 years. Yesterday, with the merger of Brickland Heights FD into GEFD, he signed a 7 year contract. New Engine 1 (1215) has arrived and will be placed into service for the first time tonight. It is a 2013 Pierce Velocity PUC. It runs out of station 1. It replaces a 1994 Freightliner/American La France pumper. Pictures can be found on the apparatus page. Halloween marked one of the busiest nights of the year, with GEFD staff responding to 20+ runs with no mutual aid. Thanks to the companies provided mutual aid for the other 30+ calls. With the merger of Brickway Manor Fire/Rescue and Blackbrick Township Fire/Rescue complete, all in-service units have had graphic upgrades including the new district patch. GEFD explorer's post has returned for its 4th year. Check out their page for more information.